Last night a large group of teenagers checked in at the Hampton Inn. Unfortunately, they were assigned to rooms in close proximity to ours. They did not seem to be intentionally unruly, but were definitely wired about their visit to St. Louis. And doubtlessly they had no idea that the loud talking and laughing they were doing in the hall carried into the rooms nearby. When we learned they’d be there another night, we decided to check out and move to a Homewood Suites a few miles away, where we were planning to go tomorrow anyway. We did have an opportunity to talk to the chaperones of the teens before we left and assure them (since we had complained to the front desk the night before) that we didn’t think the kids were intentionally misbehaving, just in need of guidance on appropriate hotel etiquette. Fortunately we were able to check in at the Homewood at 9:45. After being told there was no upgrade opportunity because the hotel was sold out, we pulled out the Hilton app and showed the desk clerk all the various room types that were available. Like magic, an upgrade opportunity suddenly materialized. After unpacking, we returned to the stellar Forest Park to visit some of its major attractions. 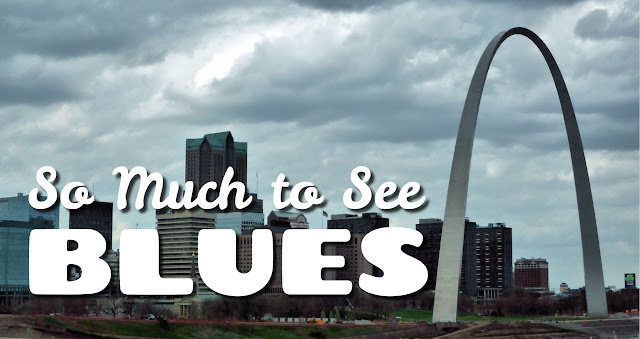 Back at the park, it took a few minutes of trolling before we finally snagged a parking space in the free lot near the St. Louis Art Museum—not that we mind paying for parking but we found the museum’s $15 parking fee a bit excessive. To add icing to our frugal cake, we were told when we entered the museum that admission is free. On Fridays, even the special exhibits are free. 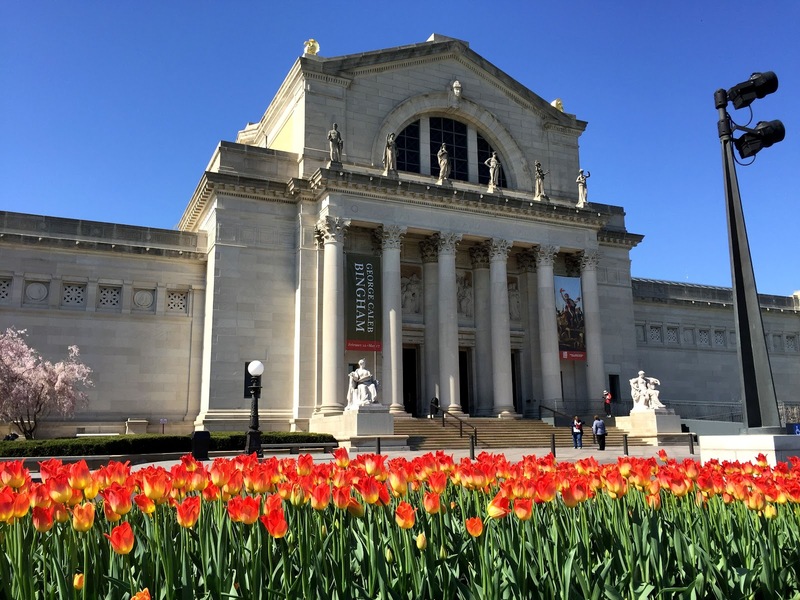 Founded in 1879, at the end of a decade that saw the establishment of similar institutions in most major American cities, the St. Louis Art Museum (SLAM) was originally housed in a downtown building. After the closing of 1904 World’s Fair in Forest Park, the museum moved into the Palace of Fine Arts built for the exposition. Today SLAM boasts a collection that embraces paintings, sculptures and other cultural artifacts spanning 5,000 years and six continents. Currently, the feature exhibit is a major installation showcasing the populist art of George Caleb Bingham, a Missouri artist whose paintings—or reproductions of them—were sold by subscription in the mid-1800s. 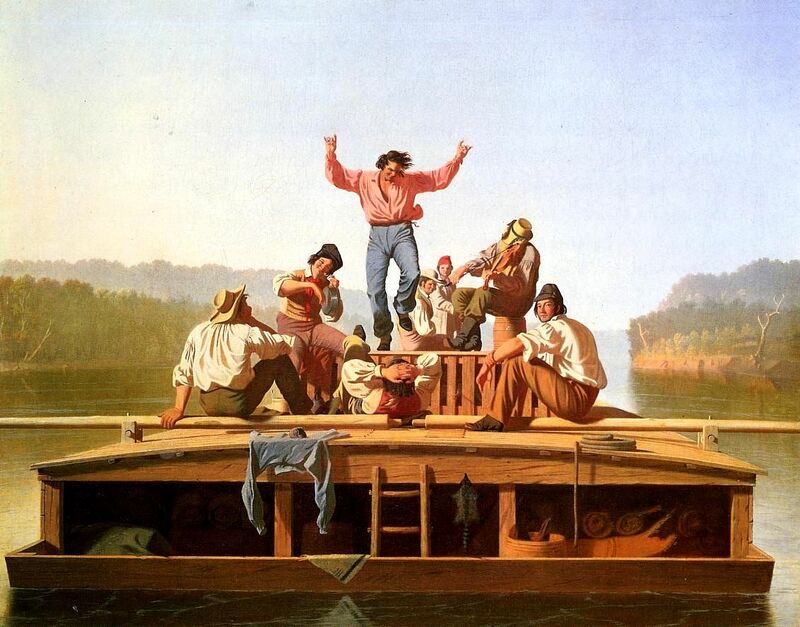 Most of his works depict life on the Mississippi River, especially those who made a living working on the river. His most famous work, The Jolly Flat Boatmen, sold almost 10,000 prints. 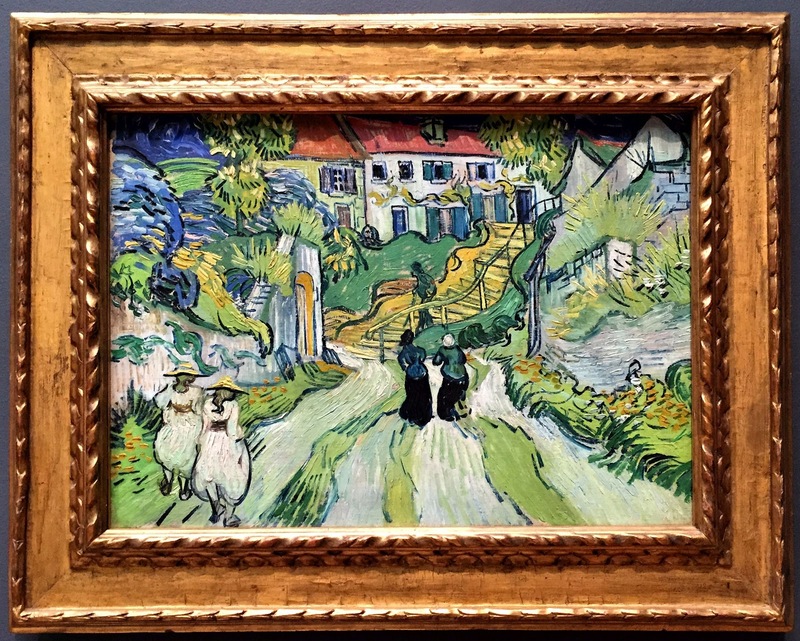 It was fun to search his other paintings in the exhibit to find some of the same faces in this painting. Sometimes, they even had the identical expression or pose. As usual, we made tracks for the Impressionist galleries, which offered a nice range of artists. 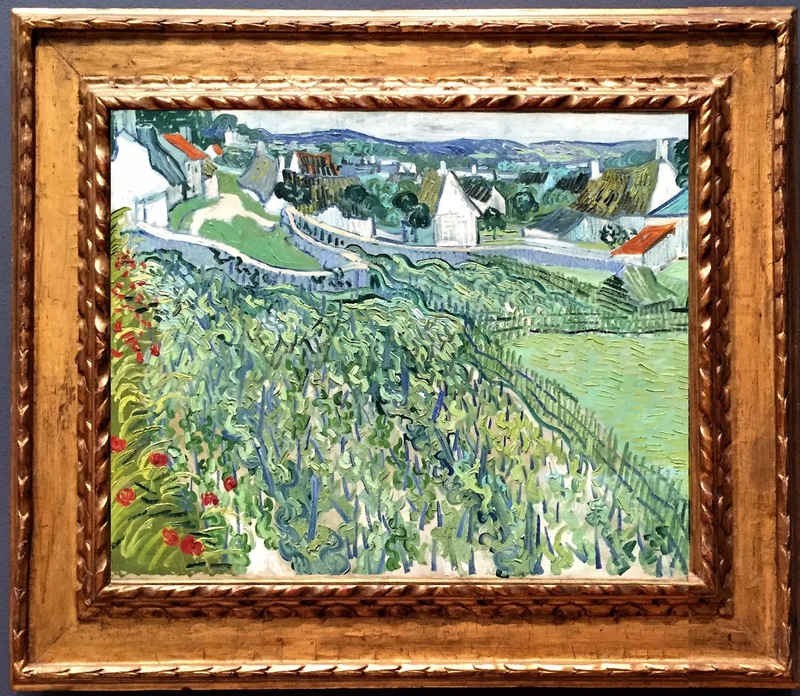 Two paintings we found especially interesting were among the last works of the tragic Vincent Van Gogh: Vineyards at Auvers and Stairway at Auvers. 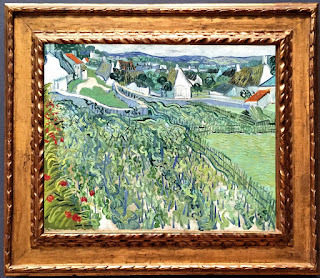 In his last couple of months, Van Gogh lived and worked in the village of Auvers-sur-Oise, just north of Paris, and produced 70 paintings. It was in Auvers where he committed suicide. He is buried in the village cemetery next to his brother Theo. 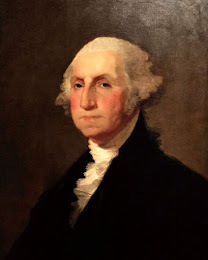 One other work that deserves mention was a Gilbert Stuart painting of George Washington. Stuart portrayed Washington in a dark jacket against an indistinct drab background to allow his face and hair to stand out. Washington’s solemn expression conveys a sense of strength, a quality greatly appreciated by his constituents in those turbulent times. Stuart painted and sold many versions of this portrait, jokingly referring to them as ‘hundred dollar bills.’ How fitting then that Washington’s portrait on the one dollar bill was based on this likeness by Gilbert Stuart. 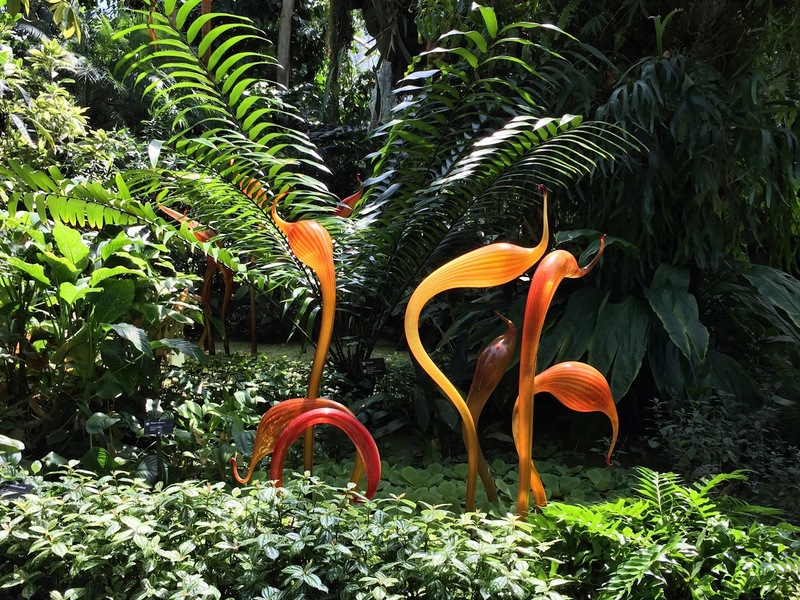 After a delectable caprese panini in the museum café, we set out to see the sculpture garden, which turned out to be closed for renovations. 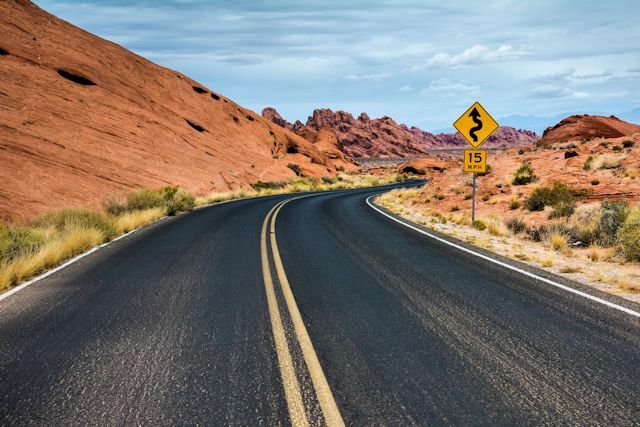 So it was time to depart, but which way to go? Plant or animal? Animal or plant? 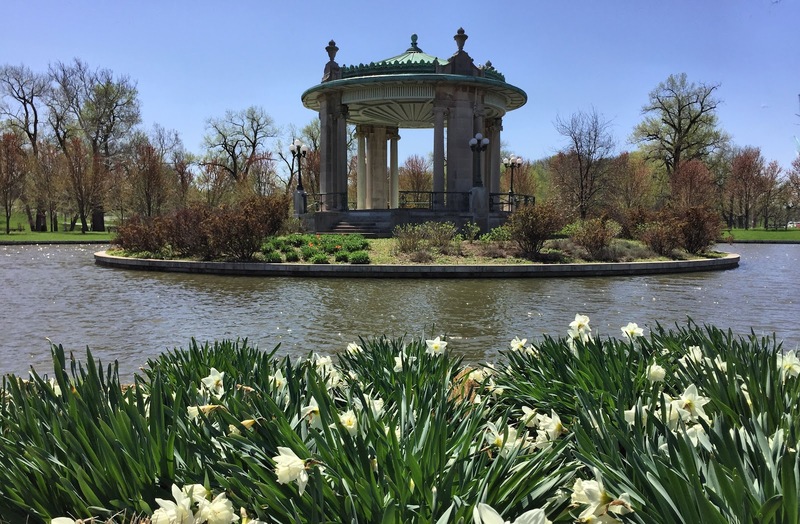 The St. Louis Zoo was just next door within Forest Park and also had free admission. But we had the Missouri Botanical Gardens on our list already and weren’t sure we had time for both since we had a 4:50 appointment to visit the Arch. Plants won this round because we thought the visit would be shorter than a stop at the zoo. So off we went to the MBG. 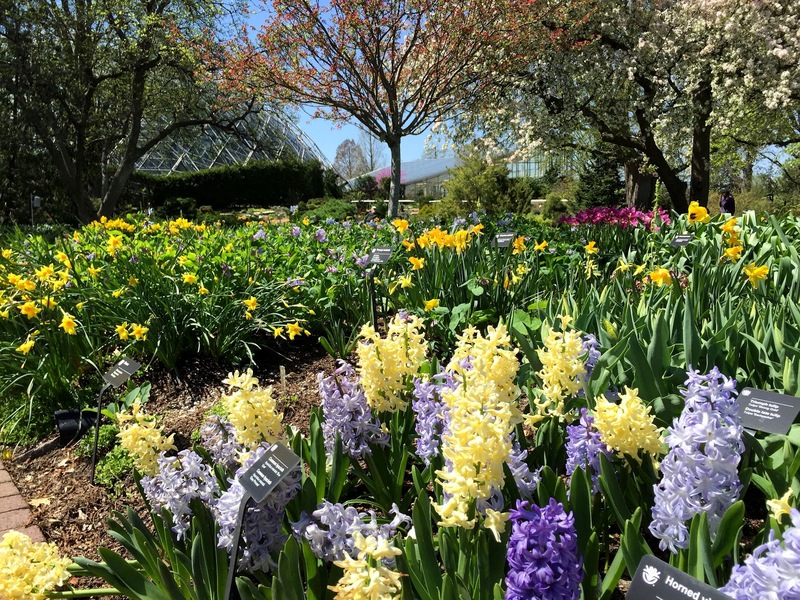 The oldest continually operated botanical garden in the U.S., the 79-acre MBG was founded in 1859 and has been recognized as a National Historic Landmark. 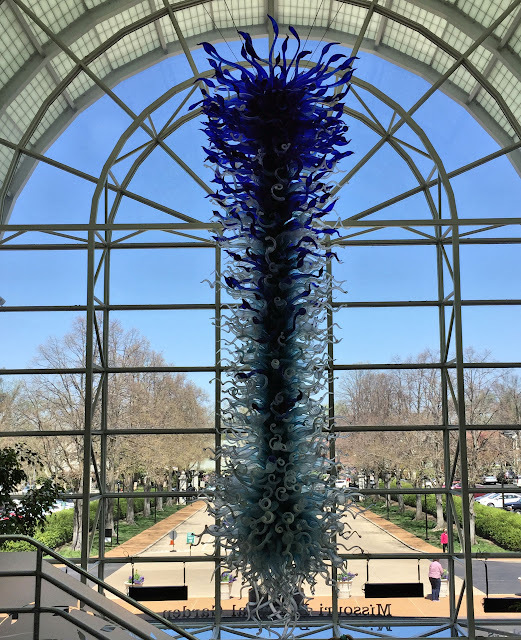 Like other similar institutions, the MBG hosted a “Glass in the Garden” show of blown glass sculptures by renowned artist Dale Chihuly in 2006. Four pieces were purchased for permanent display including the 928-piece blue chandelier which is permanently suspended in the visitor center. 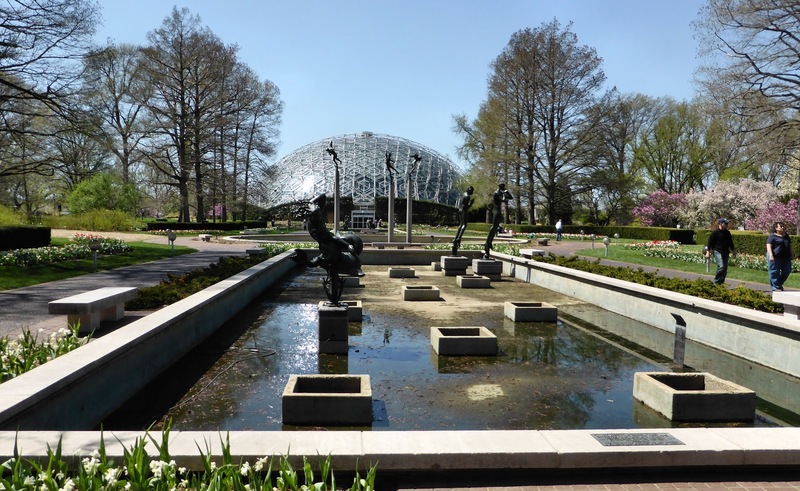 Just one in a long list of features, the gardens' Climatron is a geodesic dome greenhouse which is home to more than 1,500 plants which typically thrive in a rain forest environment. 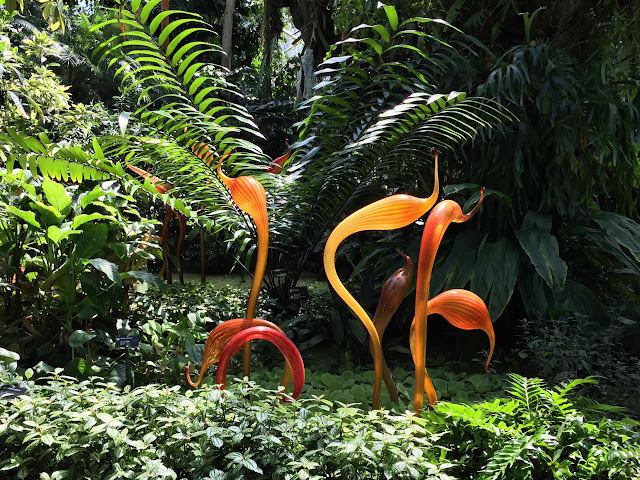 A few of Chihuly’s works found their way into this controlled environment also. After an hour and a half exploring the exquisite gardens, we had just enough time to check out the famed City Museum before our appointment at the Arch. 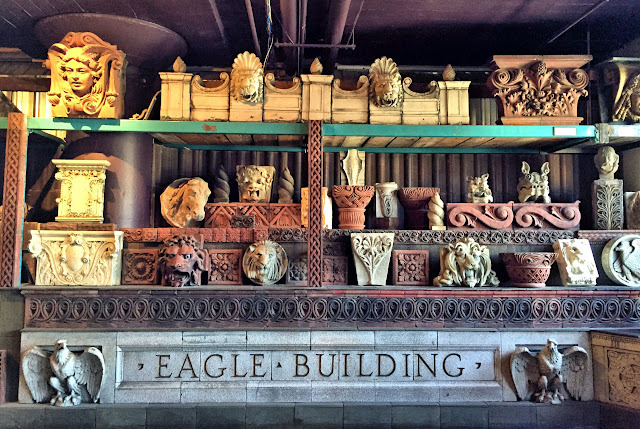 What we knew before visiting was that this was a quirky, eclectic museum with an extraordinarily nontraditional format. 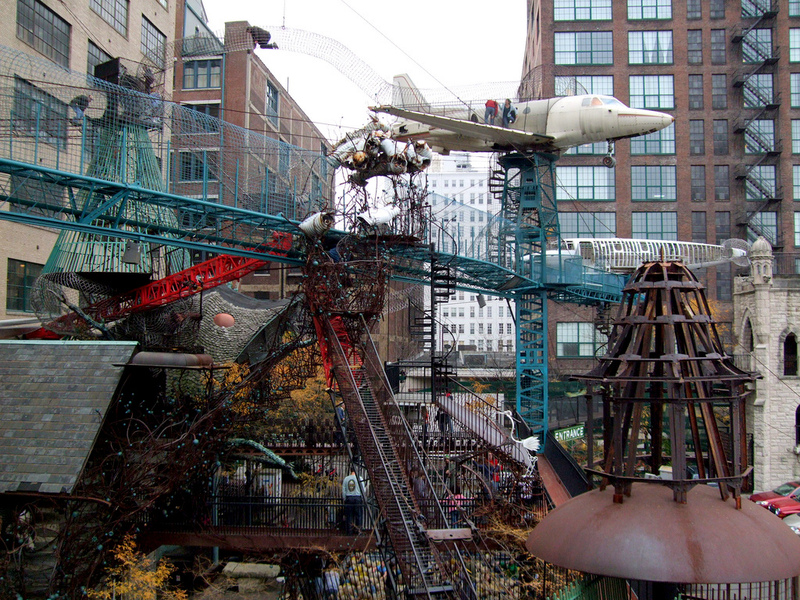 What we learned after we arrived was that City Museum is a quintessentially kids’ attraction. Housed in an old shoe factory, City Museum bills itself as an “eclectic mixture of children's playground, funhouse, surrealistic pavilion, and architectural marvel.” Spiral shafts used to move shoes from one floor to another when the building was a factory and warehouse have been repurposed into climbing tunnels and slides, both inside the building and out. 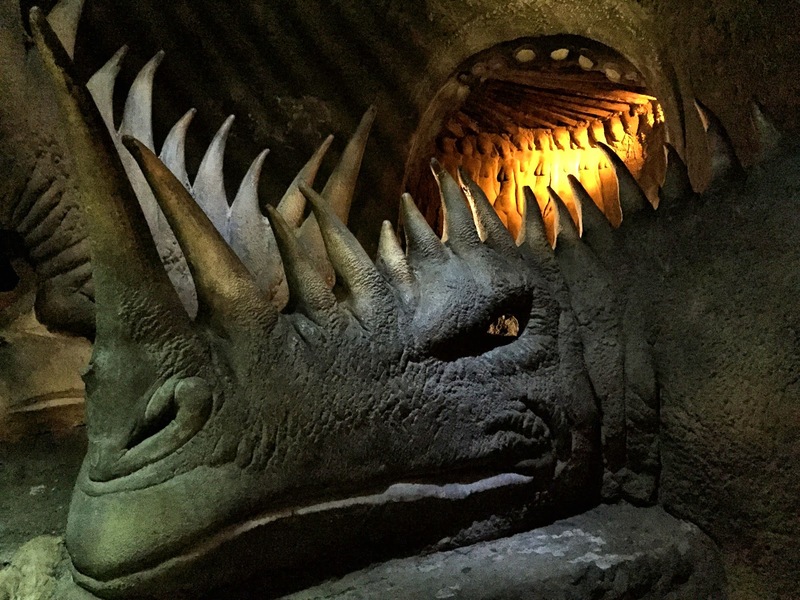 Visitors are encouraged to touch, crawl through, climb on and otherwise engage with the exhibits, which are comprised of reclaimed industrial and architectural objects. 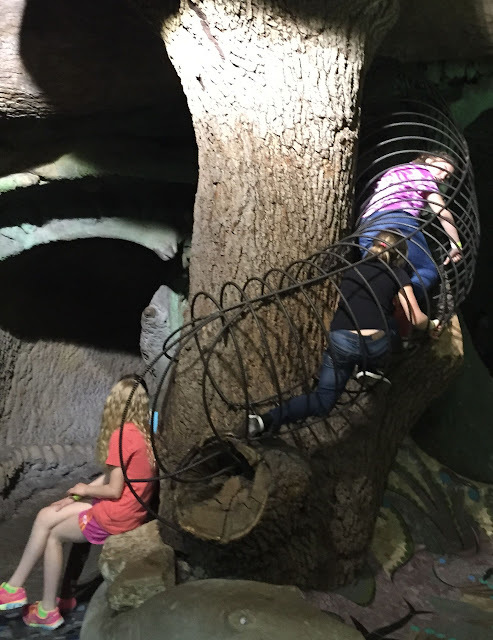 It’s a genuinely free-wheeling kind of place where kids are prompted to do things forbidden elsewhere—write on the walls, bang on the old piano, climb a “tree,” crawl into a hole. 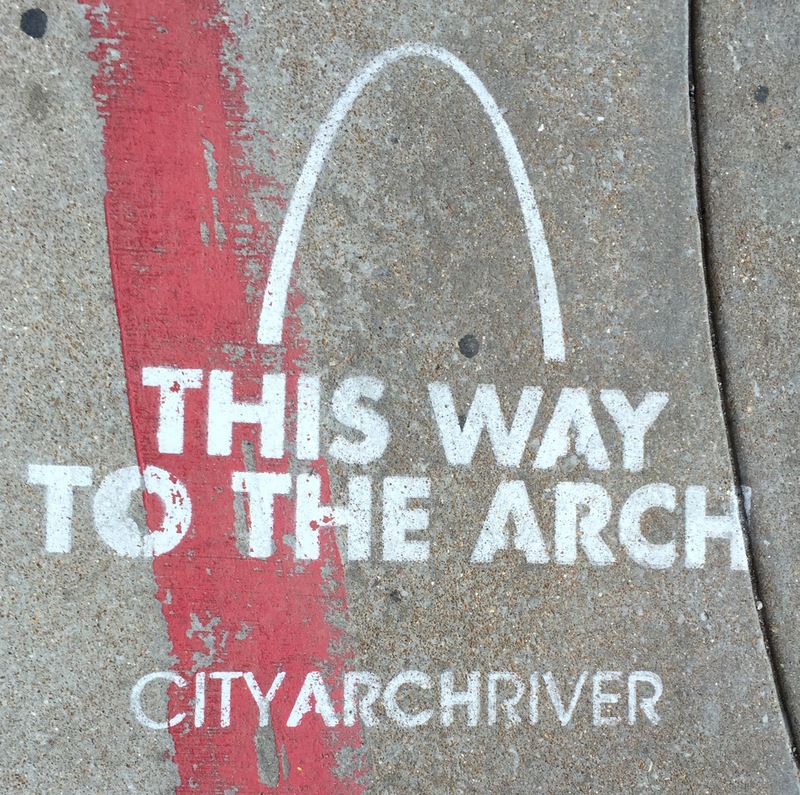 From City Museum we secured a parking space in a garage on 4th Street for our scheduled visit to the Arch at 4:50. 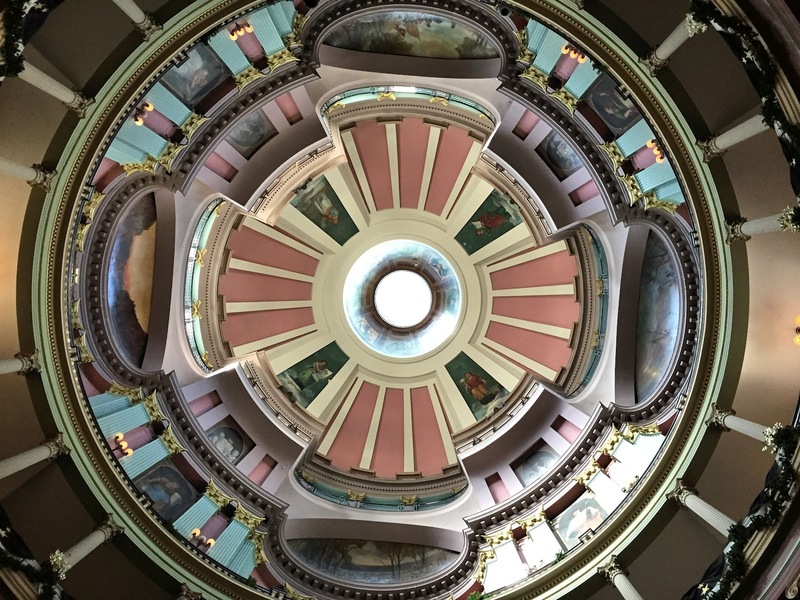 We had just enough time to visit the Old Courthouse, which houses the temporary arch visitor center, to pick up our tickets, check out their exhibits, and take advantage of the photo op from nearby Kiener Plaza. 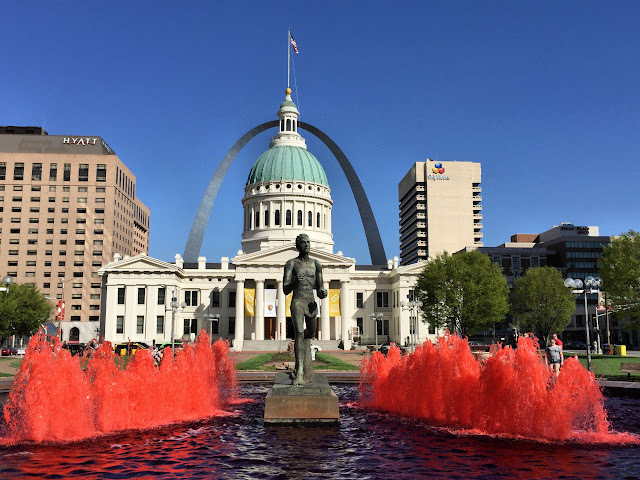 Today the plaza fountain was dyed red in honor of the St. Louis Cardinals’ opening day game, lending a surrealistic but colorful note to the scene. Near our appointed time, we followed the circuitous route over to Walnut Street, past the Old Cathedral, and eventually to the Arch, the tallest man-made monument in the U.S. All the renovation involved in the “City Arch River” project has most of the park around the Arch closed at present. 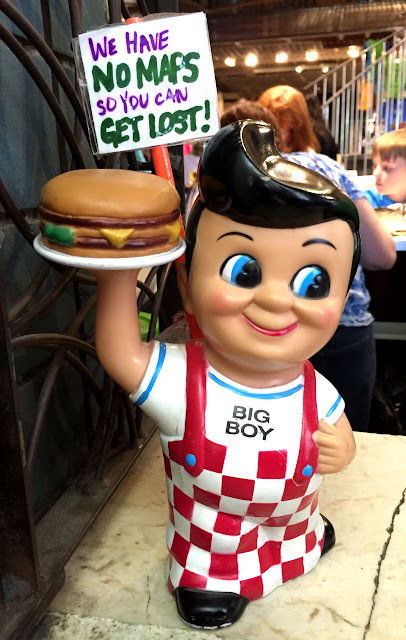 Helpful signs spray-painted on the sidewalks keep visitors from losing their way. 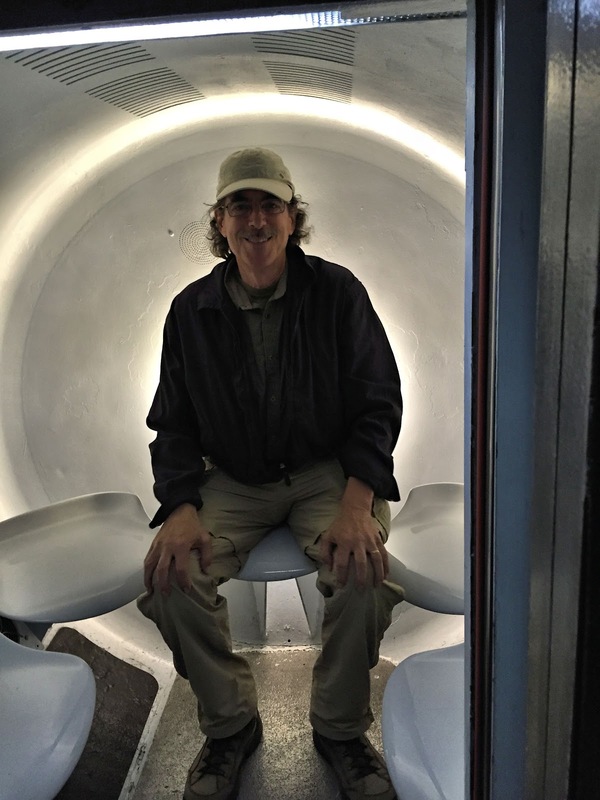 Even through the construction projects, rides to the top of the Arch were still ongoing. The art of handling large crowds has been honed to a science here. After guests line up for their appointed time to ride the tram to the top (booked at 10-minute intervals), an agent asks how many are in your group and, based on your reply, gives you a card with a number printed on it. This card indicates which of six tram cars you will ride to the top. Eventually as the line creeps forward, you reach the terraced platform and line up for your tram car. 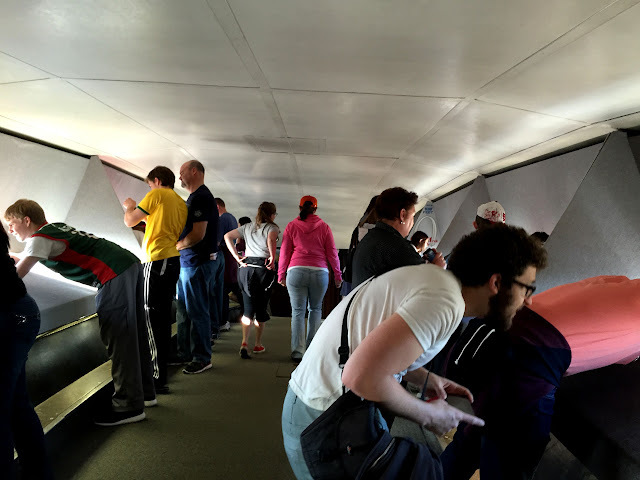 When the tram arrives, guests returning from the top exit, and new guests duck their heads and enter one of the tiny cars, each equipped with five seats. 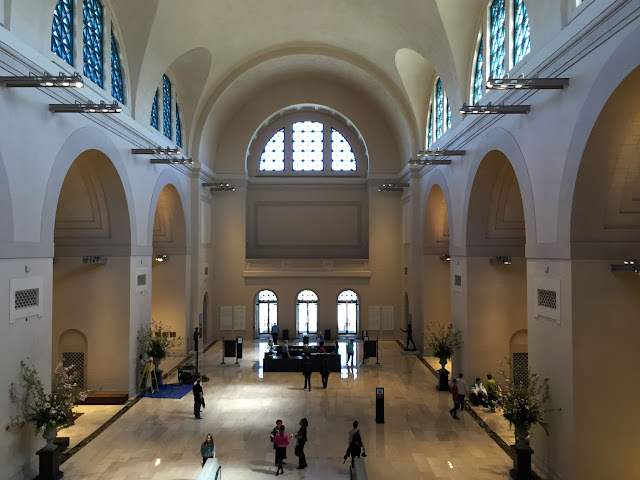 At the top of the arch is a corridor style observation platform with narrow slits of angled windows for viewing. To look out, one has to lean across the window sill. As it turned out, the concept of going to the top of the arch might have been more exciting than the actual experience. Walking back the mile or so to where we had parked our car, we decided to pause at the Brewhouse Sports Bar inside the Hyatt Hotel for a brew. With this bit of refreshment, we returned to the car and drove to P.F. Chang’s near our hotel for dinner. After this very full day, we decided to postpone our blues chasing till tomorrow. 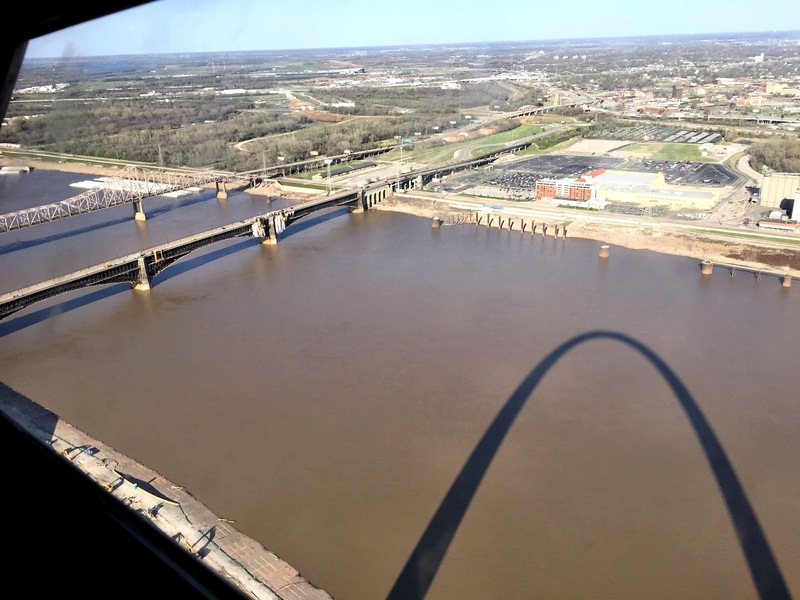 Width of the Gateway Arch: 630 ft.